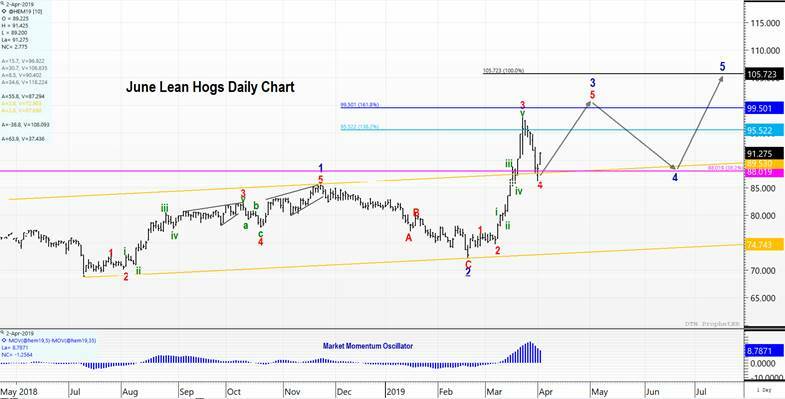 Lean Hog Futures - Tuesday Technicals - Trilateral Inc. Despite the 25% rise in only a month and vicious correction last week, the Lean Hog Futures market has room to run up much higher. The Elliott Wave Principle has been easy to apply in this situation and has done a phenomenal job of offering potential price moves despite many doubters. This is typical when a market begins to trend. The chart and evidence below suggests that we have much higher to rise, but not without opportunities to get in and out and in again. The lean hog futures market has a lot of room to run to the upside, and there will be multiple opportunities to get in and out of the market. After the breakout of the gold price channel, the market shot up and re-tested the channel from the other side while holding. This is indicative of a wave 3. The sharp correction last week retraced 38.2% (pink line) of the previous wave and ended in the price territory of the previous subwave iv. This is very indicative of a larger wave 4. The momentum on the last peak was by far the largest. This indicates a wave 3 of 3. That implies we still have more highs to make in wave 5 of 3 and larger wave 5. The arrows indicate the most probable future price potential. We would expect wave 5 to equal the distance traveled in wave 1. That targets $105.72. However, wave 5’s in commodities generally extend. This is because fear rules the market at that point. Markets fill up with fear and greed. Fear is a more intense emotion and thus plays out in a short, painful spike. Greed can play out over a longer period because it feels good. This explains why you see spikes at the top in commodities (fear of running out) and at the bottom in stocks (fear you will lose every last cent of savings), but commodities go sideways at the bottom (cost of production) and stocks go sideways at the top (greed). The fear that could drive the lean hog futures market well beyond initial price targets is the African Swine Fever situation in China. As long as the Chinese Communist Government continues to be non-transparent, fear will continue to grow and humans seem to always take the unknown to a darker place than the actual fact. Point being, wave 5 “could” get extended and travel much farther than the original target. As always, risk-management is paramount. Using the Wave Principle, we can define our risk. If this is an impulse wave higher, than by rule, wave 4 cannot enter the price territory of wave 1. The high in wave 1 is $85.25. Thus, if price go below that level, this wave interpretation below is incorrect and needs to be redrawn. It doesn’t mean we still can’t go higher, but it does mean that the evidence we presented to get long can no longer be used as a reason. For additional news and analysis on the lean hogs market, we urge you to read our Livestock and Protein Update and subscribe for an extended free trial.